• Bottom: Message tab, where you create messages to be displayed during, or at the completion of, the execution of your application. 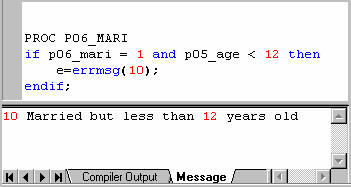 This area is also used to display the results of the compiler after you compile a program. If you have errors in the logic, the compiler will display the error messages; otherwise it will display "Compile Successful". Click on any element of the data entry or batch edit tree to see the logic which corresponds to that symbol. For example, if you click on a field, you see the logic for only that field. A group or level can also have logic associated with it. Click on the forms file node (usually the topmost node on form tree) to see the logic for the whole application. This is the way to see and enter logic for the global procedures.